This review is part of A Very Merry MeTV Blogathon hosted by the Classic TV Blog Association. Click here to see the blogathon's complete schedule. Please be sure to check out all the other participating blog posts. 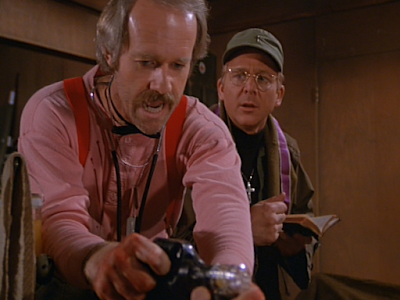 And, click here for the 2015 holiday programming schedule on MeTV. The ninth season M*A*S*H Christmas episode entitled "Death Takes a Holiday" has two strong concurrent story lines. I often remember these two plots as separate episodes but they are in fact both in "Death Takes a Holiday." Let me remind you of the power of both. Special holiday goodies arrive in the mail from home. 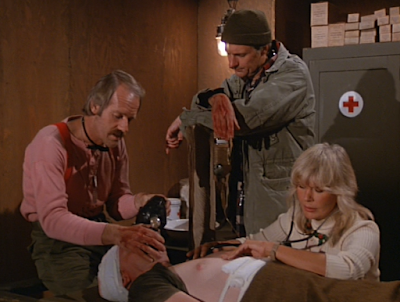 In the first story line, the doctors and nurses at the 4077th are looking forward to celebrating Christmas. When they receive a shipment of care packages from home, they are told that their shipment of turkey dinners won't be arriving. Knowing that the orphans coming to the Christmas party are counting on a special meal, most everyone decides to donate their new care packages to the party. 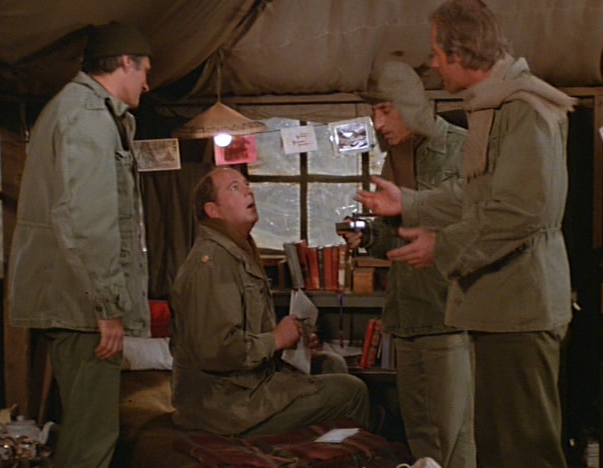 Hunnicut, Hawkeye, and Klinger apply pressure on Winchester to get him to donate to the children's party. Everyone except Winchester. While he offers up one tin can of oysters to help feed the orphans, the others are disgusted to see Winchester keep his large care package to himself. Later, Winchester secretly drops off three large boxes of fine chocolates on the doorstep of the orphanage. Hey look! The orphanage director Choi Sung Ho is played by actor Keye Luke. 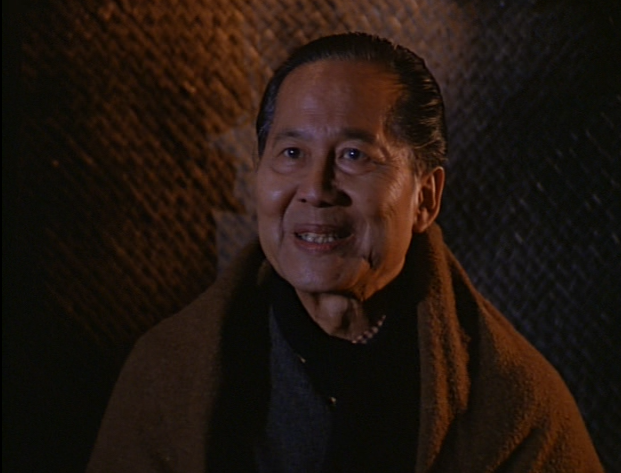 Luke also played Number One Son Lee Chan in quite a few Charlie Chan movies in the 1930s. He also played the very wise Master Po on TV's Kung Fu. His appearance in this Christmas episode makes it even better. 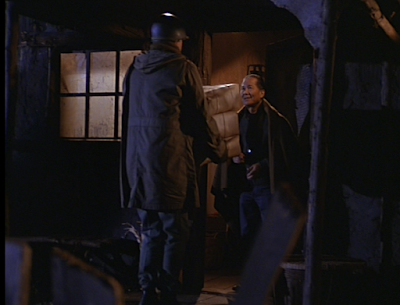 However, Winchester is caught in the act of dropping off his packages for the orphans. 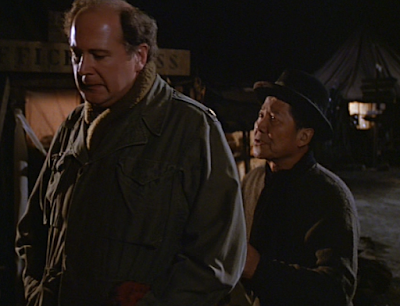 The Boston doctor explains to the orphanage director that this act of charity is a family tradition. Winchester insists that the director please keep his secret--as the family tradition requires anonymity. And, the director agrees to keep his secret. 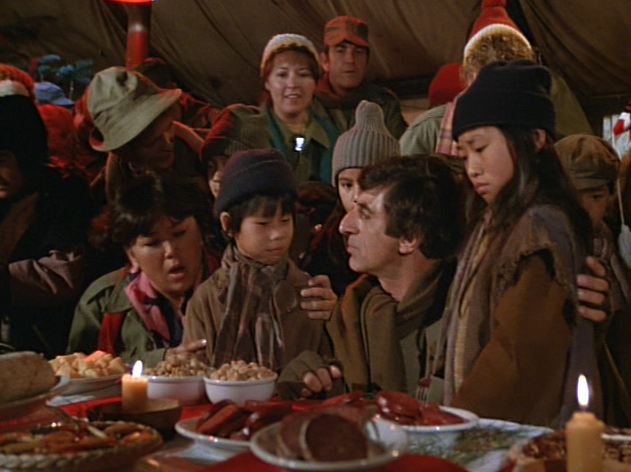 On Christmas day, the children arrive at the camp in the back of a truck. The orphanage director Choi Sung Ho thanks the camp staff for throwing the children a special party. 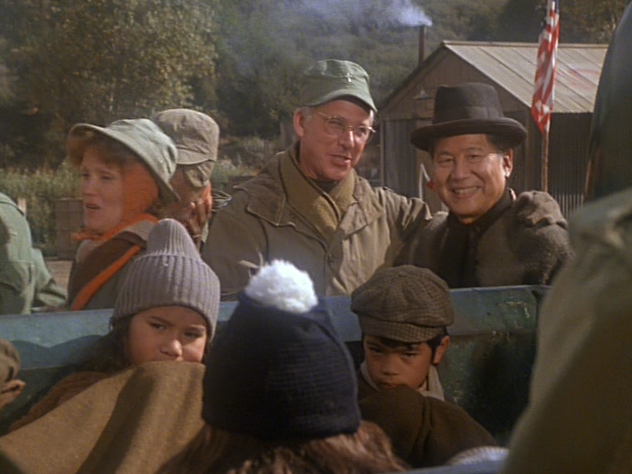 Father Mulcahy instead thanks Choi for bringing the children. He explains that the staff wouldn't have any Christmas at all if they didn't share it with others. That's actually a very nice sentiment! The party ends up a potluck spread of care packages from home--including homemade cookies, fudge, and macadamia nuts from Nurse Kellye (she's from Hawaii). Meanwhile, a jeep arrives in camp bearing a wounded soldier found shot by the side of the road. Hawkeye, Hunnicut, and Hoolihan skip the party to tend to the man's injuries. This distraction ends up being the second strong story line in this Christmas episode. Can they keep him alive until the 26th? The soldier has been shot in the back of the head. There's no hope of his living--even if he's still breathing. Inside his coat pocket, the doctors find a family photo and realize this man is a husband and a father. In an instant, all three medical staff agree to help keep the soldier alive the rest of the day--if they can--just so they can mark his death certificate with the following day's date Dec. 26th. 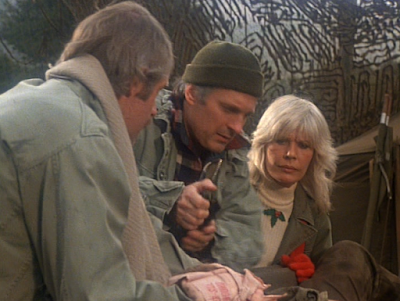 Wanting to spare his family back home from forever associating Christmas with this inevitable loss, Hawkeye, Hunnicut, and Hoolihan commit to spending the next several hours trying to keep the soldier's body functioning. Winchester catches Sgt. Rizzo eating a Boston-made candy bar. 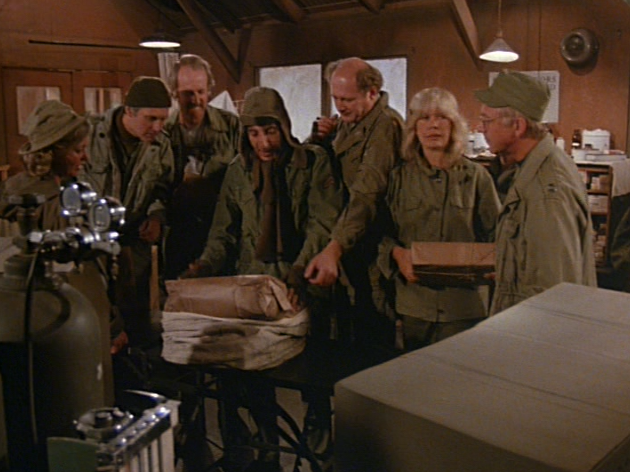 Back at the party, many of the 4077th staff continue to admonish Winchester for his greediness about not sharing his care packages from home. Charles lets the comments brush off his back. However, he catches Sgt. Rizzo eating one of the fine chocolates he donated to the orphans. Winchester confronts Choi Sung Ho at the party and demands to know why the chocolates were not given to the children and instead were sold on the black market. Even if Charles donates his gift to charity, viewers at home feel satisfied when he receives his comeuppance for being a privileged snob and out of touch with the reality all around him. With many apologies, the orphanage director smooths out Winchester's ego while explaining that the gift wasn't very practical. Choi Sung Ho knows that the chocolates may have provided the children with a moment of pleasure but he was able to sell the valuable rare treats on the black market for enough money to feed the children nutritious rice and cabbage for a whole month. In the end, Winchester comes to understand how his gift wasn't exploited. "Christmas should be thought of as a day of birth." After several hours, Col. Potter notes Hawkeye, Hunnicut, and Hoolihan's absence at the party and comes looking for them. He commends the doctors and nurse for what they are doing--if they can get away with it. As the hours pass, it becomes harder and harder for the doctors to keep the soldier's body functioning. When Father Mulcahy arrives to deliver the last rites sacrament, the exhausted Hunnicut refuses to step aside! He's not ready to give up trying. Viewers at home know Hunnicut has a wife and a child at home too--perhaps his act of compassion is more personally motivated. After hours and hours of work, the soldier eventually dies--just a half hour short of midnight. Frustrated, exhausted, and demoralized, Hawkeye, Hunnicut, and Hoolihan know they have sacrificed everything they have to help a family back home not associate Christmas with death--yet they have failed. Without any regret, Hawkeye steps over to the wall clock and manually adjusts the dial as he declares the official time of death at just after midnight, Dec. 26th. 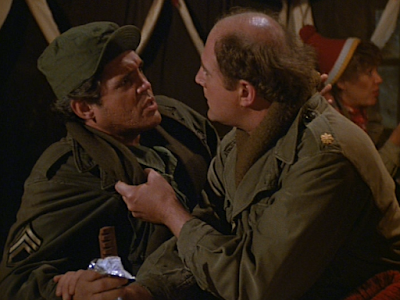 This is another powerfully emotional moment in M*A*S*H--a unique comedy series noted for its many powerful moments that make it one of TV's best. This act of defiance by Hawkeye is another he commits against the strict regulations and rules of military procedure--another of Hawkeye's defining characteristics. Of course, no summary of this episode can capture the funny repartee and the many puns on Christmas carol lyrics contained within the dialogue. You'll just have to watch it for yourself. M*A*S*H has several memorable Christmas episodes however this ninth season offering has two of the most emotional plot lines of them all. Do you have another favorite M*A*S*H Christmas episode? ChiPs, The Man from U.N.C.L.E and The Doris Day Show. And, don't forget to check out the other essays in A Very Merry MeTV Blogathon. Click here for the link to the complete list of participating blogs. This is one of my favorite M*A*S*H episodes. As you say, it has two strong storylines. I'm especially fond of the one about Winchester, which also reminds us that once we give a gift, we have no right to judge how it's used. 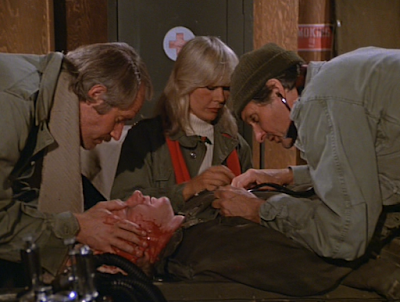 Yes, indeed, this was the 4077th at its best. Great pick, Joanna! Pure genius! 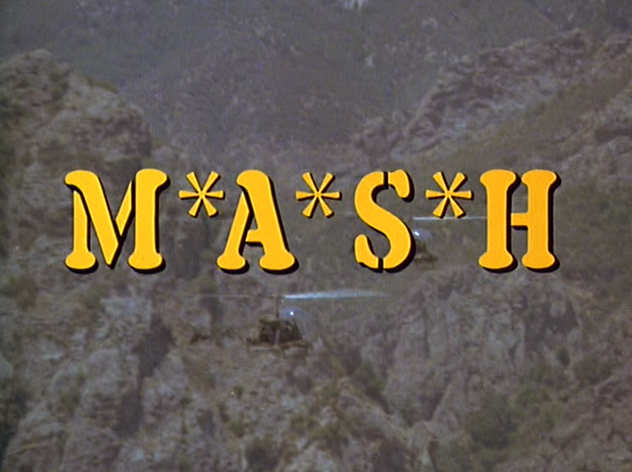 MASH will never be equaled in the way it could be heartwrenching and funny with equal measure. Having recently gone through the entire series again I know this episode well and you do it justice. Another terrific outing. Thank you. Funny, I never knew the "A" plot about the orphanage and the care packages. I just remembered the plot about the dying soldier. And what I remember most is B.J. 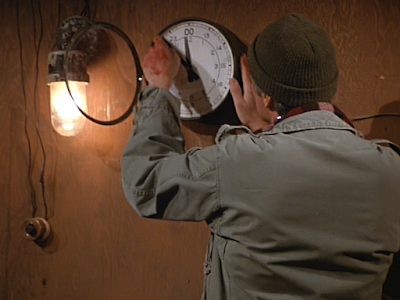 trying to stop Father Mulcahy from giving Last Rites, saying in effect "You can't have him yet!" To which Fr. Mulcahy replied, "I have never interfered with your work. Do not interfere with mine!"